Ryan Dean—or Winger—is a fourteen year old junior who plays wing on the rugby team in Andrew Smith’s “Winger” (Simon & Schuster 2013). That’s right. He’s precocious. Thank heavens his horniness is charmingly creative. That’s because he’s so vulnerable and at the mercy of his teenage hormones. And the author is very funny. Annie is Ryan Dean’s best friend—a sixteen year old junior—at their prep school in Oregon. He’s in love with her, but she calls him “Little Boy.” Ryan Dean has been sentenced to live in the dismal Opportunity Hall due to a cell phone hacking infraction and therefore cannot go to the Halloween Dance. When rugby teammate and close friend JP announces he’s taking Annie to the dance, Winger starts a fight with him during a practice skirmish. Few fights or skirmishes are so riveting. What Ryan Dean does to JP, step-by-step, I could visualize and almost admire for its cleverness. Coach M, who’s a Brit, and cares for these boys, is not only a ref for the team but acts as such to the reader. As long as Coach condones the rough play, it’s not TOO rough—not too aggressive. At least for awhile. Ryan Dean is never a wimp. He makes up for his lack of size and strength in speed, wiriness, craftiness. He’s the trickster. Camaraderie among teammates—one of whom is openly gay (Joey) and seems to be accepted regardless–is sweet and funny. They do taunt Joey, but with good nature. Even after being beaten up on the field and sometimes off, there’s camaraderie among teammates afterwards. There’s a boy-code of honor in athletics. Until there isn’t. The violence augments to a point that is trying. His horniness does too, and I’m just thankful the author is so funny. My one gripe is the role of the girls. They’re smart and athletic, but they’re just girlfriends in this story. Okay, so it’s a boy book (that girls will like, too). If you don’t already know this stuff, you learn a lot about boys on sports teams. 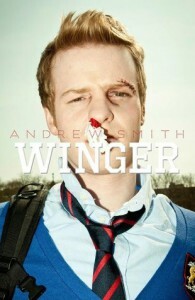 “Winger” is well written—the tragic ending seems real. And along the way you’ll laugh. Until you don’t.